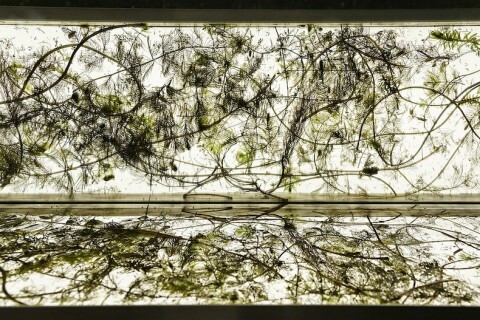 Ja Natuurlijk (Yes Naturally) is a collaborative art manifestation that is taking place at GEM, Fotomuseum and Gemeentemuseum in The Hague until August 18, 2013. The exhibit embraces the increasingly ambiguous space between our ideas of nature and society, linking the diversity of works on display to two essential questions: What is natural? And who or what decides? With Artistic Direction from Ine Gevers of Niet Normaal, Yes Naturally showcases international artists’ perspectives on the merging of natures and cultures, making its mission to “not distinguish between human[s], nature and technology.” Establishing at the outset that nature and culture are highly intertwined phenomena — more connected than discrete — the exhibit swiftly departs from old-school Western notions of society as wholly separate from nature, diving into a highly experimental realm between the fields of art and science. The viewer must quickly accept these basic principles — that there is no such thing as artificial, that nature and culture are one in the same, that cities are ecosystems — or else be left out of the logic and insight provided by the exhibit. While the pieces that make up Yes Naturally range from the silly to the serious, they are all undeniably full of humour. Onslaughts of laughter are inevitable, and will lead to moments of clarity and a deep understanding that humanity and technology are indeed a part of, not apart from a broader terrestrial ecology. The jocularity of Yes Naturally brings with it hilarious and liberating cognizances. While taking the traditional form of an art exhibit, Yes Naturally is more of a hybrid-species: an art-gallery meets science-museum meets fun-house. The exhibit is spread within the museum, with installations spilling over the walls and spread throughout the museums’ stately grounds. Visitors are first greeted to the exhibit by playful sculptures made from discarded plastic materials, adding colour to the museums’ ornamental pools. These large, floating artworks by Filipino artist-duo Alfredo and Isabel Aquilizan are made up of thousands of waste materials that have been ritually transformed into fetishized objects made to protect species and places in nature. Within the museum’s walls, Finnish artist Antti Laitinen’s video installation Bare Necessities is a humorous critique of the highly romanticized ideal of ‘going back to nature’. Laitinen takes this idea to its bitter end, and shares his experience of going into ‘the wild’ without supplies. Along with capturing humorous images of Laitinen, stark naked and struggling to make a fire, the videos include more solemn moments where the artist, staring blankly over the tree-topped horizon and into space considers the brutish and unforgiving reality of a life ‘back in nature’. Further into the exhibit, Bio-artist Egied Simons’ works are small aquatic ecosystems, complete with water, flora, and microscopic water-insects, and neatly contained within three aluminum boxes. The lids of the boxes reflect and magnify their contents, creating a luscious and fine grained pattern that looks like a romantic landscape painting when viewed from afar. Simons brings microscopic subject matter typically relegated to the realm of biology and life sciences to a wider audience. His work allows the viewer to gaze into the scientific/organic world of the micro, offering a powerful experience of the incredibly small beating hearts of snail embryos. With his highly contained ecosystems, Simons explores how science and magnification “makes the small tangible, instantly endowing it with significance and emotion”. Also making use of ‘living art’ but with a decidedly more political tone, Simon Starling’s Island of Weeds is a refuge for plants. Responding to the Scottish government’s regulation of the growth rhododendrons — introduced from Spain in 1763, and thus deemed a non-native species to be eradicated — Starling has constructed a safe asylum for the offender-organism. In doing so, Starling deconstructs the flawed concept of a ‘native’ plant species. In the context of a highly globalized world — where plant life need not yield to human-defined borders — Starling renders the Scottish government’s policy cruel and ridiculous. While the humorous tones of the exhibit range from hopeful visions of the future, cynical critiques of the present, and appeals from social and environmental activists, Yes Naturally is above all an exercise in absurdity. Within this absurdity, its tricky and ambiguous subject matter is given room to breath, allowing its radical principles to be more readily accepted by its viewers. 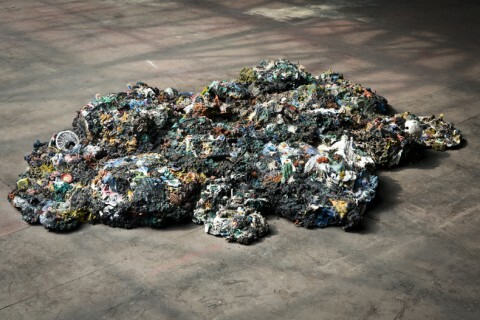 At the end of the exhibit, gazing over a sun-baked mass of plastic – a piece of the Pacific Ocean Garbage Patch retrieved by Maarten vanden Eyed, the viewer is mentally prepared to accept that plastic from this horrid pollution is natural, a sort of 21st century formation of coral. And while plankton are adapting to this new nature-culture rapidly, physically incorporating the plastic’s nutrients into their metabolism, so should we – conceptually. As the visit to Yes Naturally comes to an end, visitors get a chance for final reflections with Finnish artist Tea Mäkipää‘s Petrol Engine Memorial Park. Lining the museum’s western wall, abandoned, rusty cars have been ornamentally transformed into large garden beds. Set in the near future, the installation’s plaques playfully proclaim the end of the ‘age of oil’. 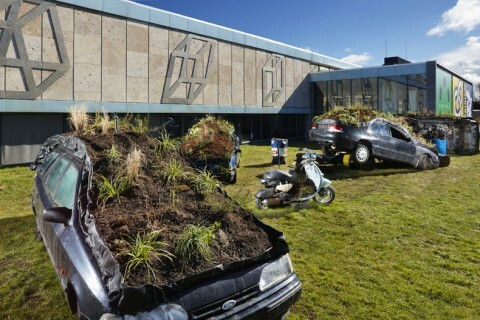 The car-garden beds triumphantly embrace an unmentioned new world order, fanciful flowers and plants grow organically upwards, embracing the sky – the antithesis of a world of pollution, petrol and plastics. As today’s cars rumble by on the busy city streets, the viewer can contemplate how a change in the order of things — from petrol-economies to something more sustainable, perhaps — necessarily must grow out of the old world order. Shedding the skin of the petrol age, this new age will take up its refuse and trash as resource, and make new out of it. Many more works make up Yes Naturally, each exploring how culture and nature can reinforce each other and in the process create conditions for a better world. The exhibition, at the GEM Museum for Contemporary Art, Fotomuseum and Gemeentemuseum, is open until August 18. The program for Yes Naturally consists of several events and exhibitions at several locations in The Hague. Be sure to take a look at the agenda since there’s a lot to do, see and explore.